Friendly bottle-nosed dolphins greet visitors in the unbelievably clear and warm waters off Grace Bay on this beautiful island, where miles of sugary-white beaches are protected by a healthy coral barrier reef. It is hardly surprising that this tropical wonderland has become the most developed of the Turks and Caicos Islands, alluring to thousands of diving enthusiasts and holidaymakers intent on getting away from it all. 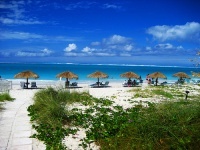 Although well equipped with tourist facilities, including an international airport, superb hotels, a casino, a golf club and several small shopping malls, Providenciales remains largely unspoilt. The beaches stretch for miles and on some of the little offshore cays it is still possible to imagine you are Robinson Crusoe. Unlike the famous literary castaway, however, visitors to Providenciales (known usually as 'Provo') have purely pleasurable pursuits with which to occupy themselves. Most find it difficult to tear themselves away from the beach, but with so many watersports on offer it is hardly necessary to do so: scuba diving, snorkelling, sea kayaking, parasailing, windsurfing, fishing and sailing are all popular diversions. Not everything is water-based, however. It is great to hop on a bike and go exploring to see the sights. Among the attractions on the island is 'The Hole', billed as 'a beautiful bottomless pit', near Long Bay Beach. One can also wander up the hillside above Sapodilla Bay to read the graffiti on the scattered rocks left by shipwrecked sailors in days of yore. At the Caicos Conch Farm visitors can see how Conch is grown, before settling down to sample this delicious mollusc along with some fiery rum punch at one of the many superb local restaurants. Just offshore, more interesting creatures await on Little Water Cay, a haven for rare Rock Iguanas that can be viewed from raised boardwalks.